I thought about this long and hard, I'm not one to criticize and in fact if you take a look around this site you'll see that opinion posts or experience posts are virtually non-existant. However, this case was just so infuriating I thought it best to put it out there and test what response I got. This is the story of my love affair with Booking.com and how it ultimately ended when i had the absolute worst customer experience with them. So here it goes. Here's the story of my horrible Booking customer service experience. Me and my parents where gonna take a joint trip to Istanbul during the last week of june. Due to my mother's issues with walking we deliberated long and hard about picking out the best hotel option. Out of ignorance but through seeing that this hotel was apt for disabled guests we decided to book our 6 night stay (through booking) at hotel A (not gonna name names because the hotel itself has no blame in this issue). Two separate rooms, one for them and one for me. One thing led to another and I told my significant other to join me so we canceled my single room (no problem there, got the email and everything) and booked another double room. After a few weeks we found out the hotel wasn't in a neighbourhood that was particularly good for wheelchairs (a big deal for my mother) so we decided to cancel our reservation. Here's where the problems begin. I told my parents to cancel their reservation and I would cancel mine. I got the room with the free cancellation option so I thought it wouldn't be a problem, supposedly it wasn't. 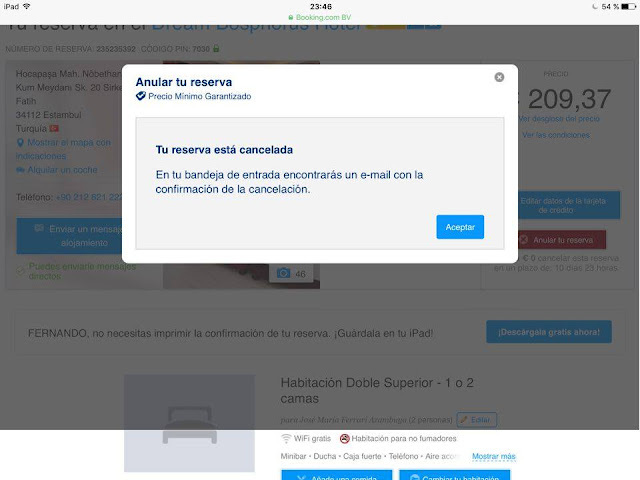 I clicked on the "cancel my room" option and since i was still within the dates allowed I got a pop up that read (as the image shows) "Your booking has been cancelled, in your invoice you'll see an email with the cancellation confirmation". I clicked on "Accept" yet I still saw the room as booked so I clicked again, and again, and again because I didn't receive an email either. However, I assumed that perhaps it was an internal error and the email would arrive at a later date. However, thanks to the suggestion of my significant other i took a screenshot. I got an email from the cancelled hotel room asking if we I would like them to pick us up from the airport. 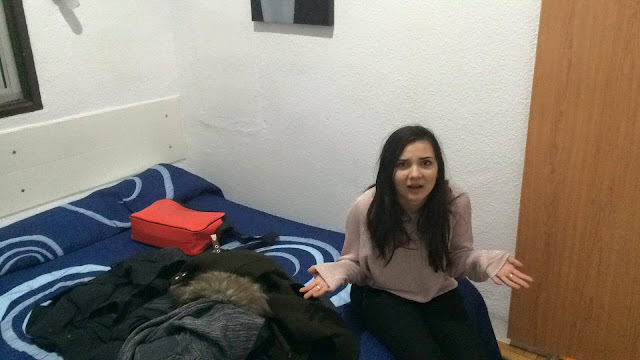 I was surprised and saw that my room wasn't cancelled. I tried cancelling it again but at that point you couldn't do so without paying the full price (we had already booked another room directly with another hotel). I called Booking customer service and they said I didn't cancel my room though I explained the situation and how I clicked yet nothing happened. I felt helpless and doomed until I remembered I had the screenshot (Finally! A way out of this mess!). I told them about the screenshot that showed the ID of the reservation and the pop up. They told me to send it over to them and they would call me back in a couple of hours (surprise: they didn't). It had been a few more hours so i decided to call them back (time was of the essence). Guy nº1: No, you didn't cancel, you didn't click on the "accept button". Me: Yes I did, otherwise why would i have taken a screenshot of the pop-up? What do I stand to gain? Guy nº1: It says you didn't press the button, you have to pay the full price. That call ended. My partner called them and the issue the second time around was that the customer service girl said she didn't see the reservation ID, she couldn't see the numbers in the image. You guys can see it right?? What made things worse was when upon insisting that we could see it very clearly on the top left side of the screen shot she called my partner "honey". Seriously? "Honey"???? Is that your customer service attention? "Honey"?? Obviously she called her out on the issue of not calling her honey since it wasn't very professional. After this we had no choice but to go to that hotel since our room wasn't cancelled. Even while having concrete proof (not just my word) they didn't do anything. It was the worst customer service experience in my life and the reason I will never use Booking.com again. They flat out lied to our faces. They could've just said "we see the issue but there's nothing we can do" but pretending they didn't even see the issue or blaming us for what was clearly their mistake just made things a whole lot worse. Finally, this isn't the first time that booking has wronged me. 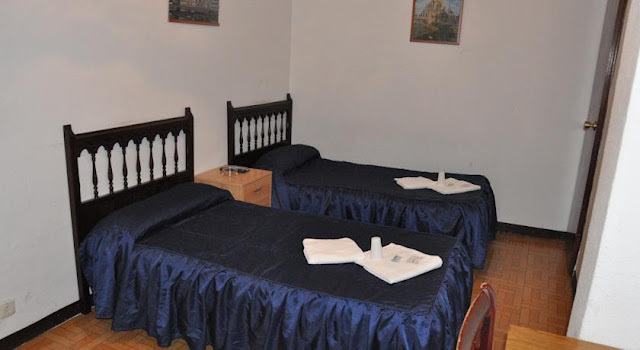 In february I rented out a room in Hostal Los Arcos in Madrid that was absolutely nothing like the pictures shown in the advertisement. Again, booking didn't really care. Here's a pic of the room we booked and here's a picture of the room we actually got (we left the hotel and lost our money). So there you have it. That was my horrible experience. How about you? Do you have some horrible experience with Booking.com? Please let us know in the comments!